A small plane sputtered and crashed into a building near a north Phoenix airport Wednesday, killing the pilot and sending huge clouds of smoke into the early morning sky. The plane, a Cirrus S-R 22 single-engine aircraft, had taken off from Phoenix Deer Valley Airport around 6 a.m. and crashed a short time later about a quarter mile away after circling back to land. 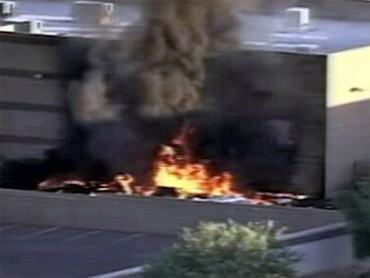 Witnesses heard the plane's engine sputter before it crashed into an industrial building outside the airport and burst into flames, said Detective James Holmes, a Phoenix police spokesman. The crash destroyed the aircraft. "What you have is a bundle of charred metal," Holmes said. The Federal Aviation Administration was sending investigators to the crash scene. The pilot died in the crash and was believed to be the only one on board, said FAA spokesman Allen Kenitzer. The pilot's name has not been released and no injuries were reported on the ground. The plane is registered to a corporation called Magneto Investments of Phoenix.